The Florida Legislature requires that lead agencies obtain a minimum of $1 million per claim and $10 million per incident in general liability coverage. Yet, many of the state’s lead agencies have not acquired appropriate amounts of coverage to protect children who are harmed while in their care. Sadly, one West Palm Beach teen recently dealt with this issue when a now-defunct social service agency agreed to pay her to help overcome years of sexual abuse, but didn’t have enough insurance coverage to pay the claim. A lawsuit has been filed against the insurance company, claiming it did not make sure the agency had the proper coverage to compensate children who were victims of sexual abuse while in the care of the agency. While millions of dollars of insurance coverage is required, the agency reportedly held only $250,000 in coverage. Florida child welfare administrators have had a long, troubled history with privatization of foster care services provided to the state’s at-risk, harmed, abused, and needy children. Our children have suffered sexual abuse, child abuse, personal injury, and other harm for years. Florida, it seems, wasn’t the only state with issues. A lawmaker in Kansas, the first state in the U.S. to privatize such care, has written a report on that state’s failures with foster care privatization and now is seeking to rescind the state’s program. In what had been the first-in-the-nation privatized foster care system, the state legislator looked back on the program’s 20 years, only to see “increasing scrutiny and a record number of children in foster homes,” local media reported. In his report, “When Children Die We Must Act,” the lawmaker concluded that “the mid-1990s privatization wasn’t successful, the Topeka Capital-Journal (http://bit.ly/1RxWskK ) reported. 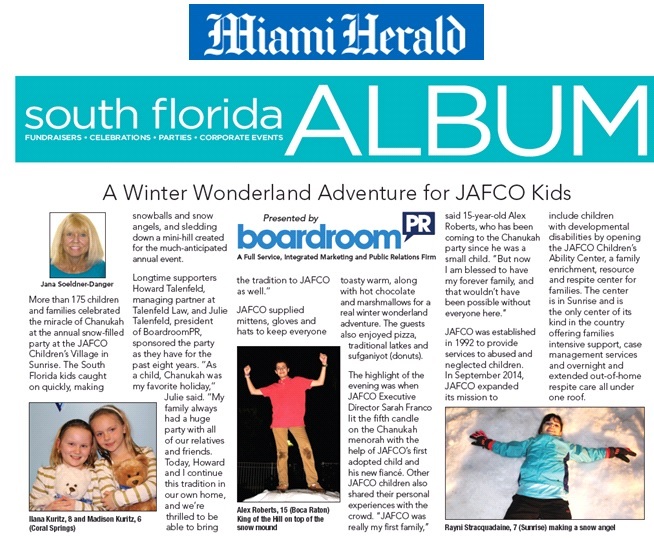 More than 175 children and families celebrated the miracle of Chanukah at the annual snow-filled party at the JAFCO Children’s Village in Sunrise. Children’s right attorney Howard Talenfeld and his wife Julie Talenfeld sponsored the party, as they have for the past eight years. Business executives, civic leaders and attorneys who advocate for the rights of those who suffer child abuse, personal injury and other harm and neglect will gather in February for the Florida’s Children First 2016 Broward Reception. The event will be held Thursday, February 25, 2016 at 5:30PM at the The Riverside Hotel (620 East Las Olas Blvd. in Fort Lauderdale). At the annual fundraiser and awards event, Florida’s Children First – the state’s premier child advocacy organization – will honor child advocates who strive to make a difference in the lives of the state’s most vulnerable kids. Florida child advocates and child abuse attorneys who represent children and families in cases of wrongful death, child abuse and other personal injuries, are watching closely as the Florida Department of Children and Families reviews the death of Knowellan Kelly, a 15-month-old who died at All Children’s Hospital in St. Petersburg Sunday night. Though Florida DCF had received a report on suspected abuse four months ago, allegations were unsubstantiated and the DCF Critical Incident Rapid Response Team was not been dispatched to investigate this incident, according to news reports.